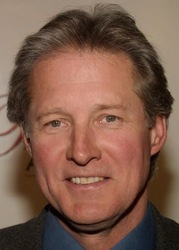 Bruce Boxleitner is an American actor, and science fiction and suspense writer. He is known for his leading roles in the television series How the West Was Won, Bring 'Em Back Alive, Scarecrow and Mrs. King (with Kate Jackson), and Babylon 5 (as John Sheridan in seasons 2-5, 1994-1998). He is also known for his role as the eponymous character of the innovative Walt Disney Pictures film Tron, a role which he reprised in the 2010 sequel, Tron: Legacy.